Yay! Here is another installment of my attempt to bake my way through Peter Reinhart’s wonderful book, The Bread Baker's Apprentice: Mastering the Art of Extraordinary Bread. 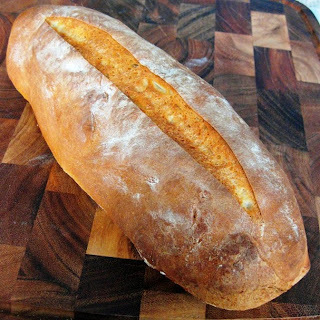 The fifteenth recipe in the Bread Baker's Apprentice Challenge is Italian Bread. I loved this bread! This recipe produced two wonderfully tasty, soft and gorgeous loaves. Taste-wise, this has been my favourite bread so far. Like the French bread, the dough was a little hard to knead but it came together nicely in the end. I made loaves but I think this dough would work well for making individual rolls for sandwiches or subs. I will be making this bread often. Enjoy! Show some love to the other challenge participants in this challenge. The kaisers are so much fun. It's because of The Knotting. This looks amazing - yum. are you baking with gas or electric? are you using any type of bakers stone in the oven?